The new Zoo Keys that are returning to the Philadelphia Zoo, in conjunction with the "Creatures of Habitat" exhibit. Therese Fox fondly remembers thrusting through the throng of red plastic elephant-wielding 6-year-olds at the Philadelphia Zoo, elbowing her way to the front of the all-out stampede of fellow first -graders on a singular mission. The year was 1969, and the reward for the first to reach the talking box was high. After all, to the speediest 6-year-old went the spoils of inserting the plastic pachyderm’s key-shaped trunk into the story box, spouting a fun fact on the animal kingdom for all to hear. “That’s the magic of the Zoo Key; you just had to run to the box faster than the other kids,” she recalled. Today, five great-nieces and -nephews and countless zoo trips later, Fox still dangles the 50-year-old red elephant Zoo Key from her house key ring, a happy reminder of the past. The new Zoo Key box at Big Cat Falls at the Philadelphia Zoo, positioned next to a large lion Lego sculpture that's also new to the zoo. Back by popular demand and operated by the turn of colorful animal-shaped plastic keys, the Philadelphia Zoo’s 20 new, solar-powered storybook boxes resemble those that previously occupied the park, with a few additions. Stationed throughout the park at both live and life-size Lego animal exhibits — part of the zoo’s “Creatures of Habitat" display, also opening Saturday — the new, bilingual boxes feature not one but two keyholes, where children can choose to listen to tales of the animal kingdom from Philadelphia zookeepers in either English or Spanish. And while your old keys from class field trips will still work in the updated story boxes, the new batch of Philadelphia Zoo Keys are made from recycled plastic, and are available for $3 each in red and purple lions, bears, and gorillas. Members will receive one complimentary green alligator key per household, and 10 percent off additional keys. In celebration of the keys’ debut, 30 life-size animal sculptures of "Creatures of Habitat” are posted throughout the zoo, crafted from “hundreds of thousands of Lego bricks” and ranging in scale from a polar bear to a dainty golden tamarind monkey. One of a handful of U.S. zoos to use fact-filled storytelling machines, Philadelphia’s Zoo Keys were available for nearly half a century until 2007, when the park cut the program to embark on “new initiatives,” Amy Shearer, zoo chief marketing officer, said. 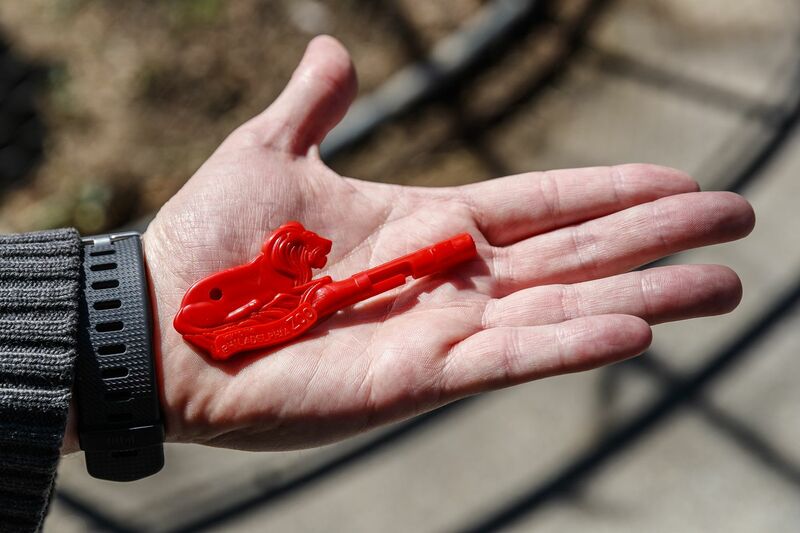 "What we realized was, wow, these Zoo Keys are so important to people’s memories and visits to the zoo, so we are thrilled to bring them back,” she said. Questlove poses with a Lego Zoo Key replica at the Phillies season opener at Citizens Bank Park last week. Shaped like an elephant with a key-shaped trunk used to unlock the talking story box, the original novelty Zoo Key was patented by children’s television host, puppeteer, and father of the modern hotel magnetic key Bruce Sedley in 1960 — the same year the keys made their debut in Philadelphia. For dedicated collectors like Mark Lyons, the novelty of the Zoo Key is equal parts nostalgia and history. Although he bought his first Zoo Key more than five decades ago on a fourth-grade field trip to the Detroit Zoo, Lyons said he didn’t become "serious about collecting” until after eBay came about in the late 1990s. Today, he estimates he’s amassed between 350 and 400 of the plastic keys from zoos across the country. Mark Lyons estimates he has collected between 350 and 400 Zoo Keys from across the country. And though the beastly keys generally sell wholesale for a couple of dollars, in online bidding wars among collectors like Lyons, it’s not unheard of for a rare and unusual Zoo Key — like a limited-edition golden Komodo dragon from Philadelphia — to sell for upwards of $225, he said. A locksmith by trade and collector of handcuffs and Zoo Keys by passion, Lyons, whose cell and home phone numbers both end in 5397 (T9 text for KEYS), runs a Facebook page dedicated to all things Zoo Key from his home in Encinitas, Calif. So far, more than 350 people have found that nostalgic bliss on Lyons’ Zoo Key page, with good portion of that fan base located in Philadelphia, according to his Facebook metrics. Didi Strubeck, 27, of Sonoma County, Calif., poses with her white alligator Philadelphia Zoo Key. Among the nostalgic: Didi Strubeck. When the 27-year-old originally from Collingswood heard the keys were coming back to Philadelphia, Strubeck knew exactly where she could find her white alligator from second grade. “I sent a picture [of the key] to my mom and best friend right away," she said. Now living in Sonoma County, Calif., Strubeck said the plastic piece of reptilian nostalgia survived two decades and a move west. When Strubeck returns to New Jersey to visit with family in May, she said, a trip to the Philadelphia Zoo is now a must. “Creatures of Habitat” will be on exhibit from April 6 until Sept. 30 at the Philadelphia Zoo, 3400 W. Girard Ave., Philadelphia. Zoo tickets are $24 for adults (12 and older) and $19 for children 3 to 11. Keys cost $3 each. 215-243-1100, philadelphiazoo.org.